When yacht owners and guests think of cruising Italy, usually they think of Portofino, Sardinia, Capri, or other coastal Med areas. Another waterborne city wants your attention: Venice. In fact, with the city’s support, three marinas have launched the Venice Superyacht Destination initiative. The intention is to raise more awareness of mooring opportunities in the historic city, along with promoting Venice’s cultural offerings. Even though Venice sees strong tourism year after year, it’s primarily from other channels. In addition, despite megayachts like Carinthia VII, Cloud 9, and Luna calling on the city over the years, few owners realize the possibilities. Therefore, Venice Superyacht Destination is targeting a wide spectrum of owners from around the world, with megayachts measuring 98 feet (30 meters) and larger. The three marinas behind the program are Venice Yacht Pier, Marina Santelena, and Venezia Certosa Marina. Each is within or near the city center. Venice Yacht Pier, for instance, offers 20 berths, all close to the famed St. Mark’s Square. With side-to dockage, Venice Yacht Pier additionally accommodates some of the largest megayachts in the world. Marina Santelena, meanwhile, is a true marina, with nearly two dozen berths for megayachts to 131 feet (40 meters). It’s on the small island of St. Elena, about 10 minutes from St. Mark’s Square. Finally, Venezia Certosa Marina, a.k.a. Marina Vento di Venezia, is on an island, too. It’s Certosa Island, between Venice’s center and the Lido harbor entrance. The three facilities decided to band together for a few reasons. 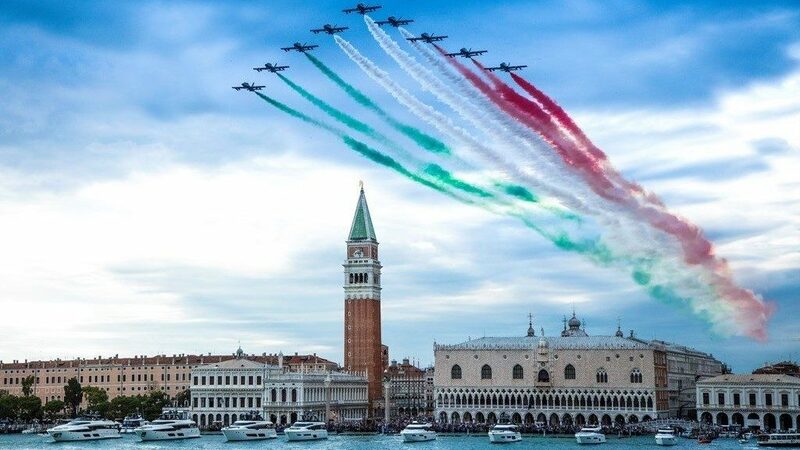 Venice has hosted a few nautical events in recent years, for example. In fact, Ferretti Yachts celebrated its 50th anniversary there last year (above). Furthermore, between two local airports, one of which can handle private aviation, as well as a large railway station, owners and guests can arrive easily. Numerous festivals and events occur throughout the year, such as the International Film Festival, Art Biennale, and Architecture Biennale. Add Venetian-specific celebrations like Carnival and Festa di San Marco. Add, too, famed restaurants, a historic golf club, museums, and more.